Package Content : 6 soft contact lenses in sterile buffered saline solution with up to 0.005% methyl ether cellulose. 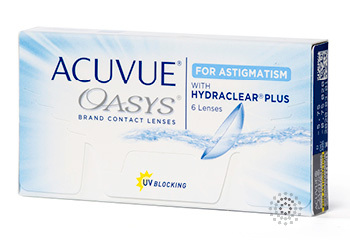 Acuvue® Oasys™ for Astigmatism contact lenses are manufactured by Vistakon® Inc., and are made from a silicone hydrogel material that is coated with an internal wetting agent that wets the lens from the inside out. The addition of the moisture rich element enables Acuvue® Oasys™ for Astigmatism to provide exceptional long lasting comfort all day long so that you may enjoy a unique, soft, silky feel – no matter how long your day lasts. These lenses are designed for wear as a two-week daily wear lens (which means you take the lenses out each night), one lens can be worn for up to 14 days. Be sure to follow your eye doctor’s recommended replacement schedule.